Bad writing isn't the only way to pull readers about out of a story. Bad formatting can as well. You put a lot of work into your story. You should present it as if it's your pride and joy. I use InDesign to format my books. I know most people use Word. Some use Scrivener. Here are some book formatting tips, helpful no matter what app you use. Sometimes I'll open an ebook and find some obvious problems like block texts or inconsistent line spacing. Makes me wonder if the author ever read an ebook. Either the author saw the problem and thought it was okay or they didn't preview the book. Both are bad. Before you format your ebook, examine other books to know what yours is supposed to look like. This is the same for paperback books. When I formatted The Sciell, I first looked at other books to figure out the size I wanted: 8.5 x 5.5. Then, I went to my shelf and pulled down books that size. Throughout the formatting process, I had a stack of books by my table. I referred to them often. Never publish your book without previewing it. I have a Samsung tablet with the Amazon Kindle app. I email the file to my Amazon account and it'll add the book to my library. You find your email address in your app's setting. There's also Amazon Kindle Previewer for desktops. Since I also need an epub version of my book, I preview the file in Adobe Digital Editions for desktops. It's free. It's also best to look at it on a mobile device. For that, I use eReader Prestigio. For print books, the distributor makes you order proofs. Comb through that book. I reread mine. I often run into spacing problems. Words/letters are either too close together or too far apart. I previewed the book on my Kindle and the divider was stretched to cover an entire page. I returned to my file but everything appeared normal. Eventually, I realize it was a text wrap issue. Certain things won't show up in your document but they might cause problems in your book file. Once you create a book file that works, save it and reuse it. You're less likely to run into problems this way. That's what I do. I don't create digital and print books from scratch anymore. Sometimes, I'll go on a book buying binge but I don't always read them right away. It could be weeks or even a month later. By then, I'd forgotten what the book is about. You can flip over a print book to find the summary. Usually, I have to search on Amazon or Goodreads for ebooks, which I don't always have time to do. I just skip over the book. 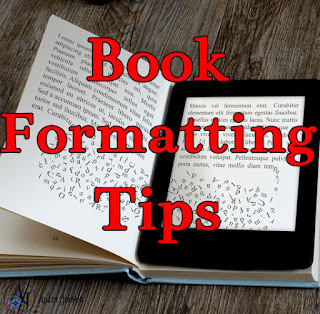 I've come across many formatting tips that encourage you to add the description in the ebook. For the reason I mentioned above, I started doing that. I haven't come across a lot of font issues while reading books but in online groups, authors often ask about fonts. I use Garamond 12 point. As far as I know, most people don't use Times New Romain. 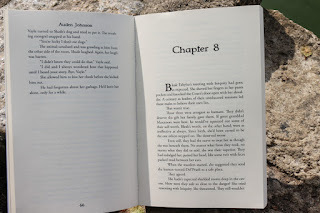 For chapter headings, I go for a bigger size, 24 for ebooks and 36 for print. I have some fun with the chapter headings for the paperback version. Immoral is The Merging World Series' font. Fun, grunge and simple. My running headers and footers are the same fonts. Don't have too much fun. Only use two or three fonts. You can do fancy chapter headings for ebooks by turning the text into an image with a transparent background. If you have any formatting questions, email me at audendjohnson@gmail.com.